Sure, you can go to college with a plain laundry bag, but is it going to be as fun as our Red Elephant College Laundry Bag? No, it's not going to be as fun! Laundry is a necessary thing you have to do in college- make it a little bit fun with our Red Elephant College Laundry Bag! Laundry bags are a dorm essential that is probably on the top of your college dorm checklist. At least, we hope it is on the top of your college dorm checklist because it is just as important as your dorm bedding! You don't want to take up precious dorm room storage space in your closet by leaving your dirty clothes in a pile on the floor, and we're pretty sure that your dorm roommate would not appreciate a heap of dirty clothes in front of your closet or under your bed. Plus a heap of dirty clothes on the floor will detract from your dorm room decor. 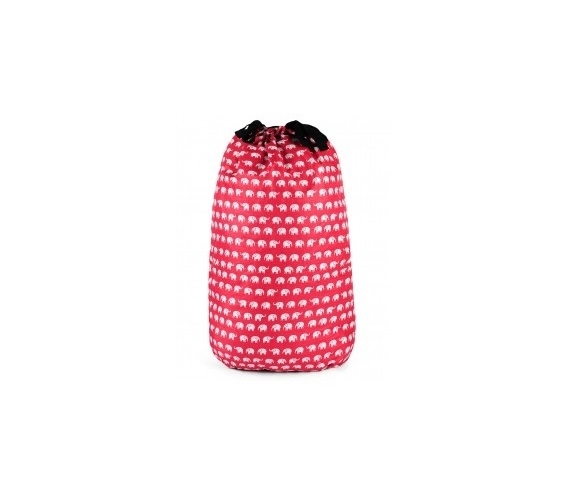 Keep your room clean and organized and add to dorm room decor with a dorm laundry bag! Our Elephant Red College Laundry Bag can fold down as compact as your favorite T-Shirt when it's not use, which makes this dorm essential item even better! Dorm Laundry Bags are also great for when you are moving to college- simply pack your clothes into the college laundry bag to make moving easier! Your dorm room is too small to have boxes and bags hanging around that you will never use again. Use items such as your dorm laundry bag and dorm trunk that you will be using in college to pack things up and help you move!